The perfect partner for your Olympic bar, the Best Fitness Multi-Press Stand BFPR10 lets you perform calf raises, lunges, dead lifts, upright rows, and a host of other power-building exercises. The Best Fitness Multi-Press Stand BFPR10 is outfitted with a pair of seven-position angled uprights that let you determine the correct lifting position for each exercise, along with 4-inch liftoffs and 7-inch safeties that make it comfortable and predictable to rack the bar. The sturdy A-frame construction, meanwhile, offers a tough 10-bolt assembly that stands up to use and abuse. Best of all, the rack's reverse pitch accommodates your body's natural lifting path, so you can perform your exercises safely and efficiently. Other details include rubber surface pads and a durable powder-coated finish. Compatible with the Best Fitness BFPR10 adjustable bench, the rack measures 29.5 by 56.5 by 45 inches (W x H x D) and carries a three-year warranty. Working with freeweights is most effective when you feel safe enough to use heavy weight and push the envelope. Partner up with the Best Fitness Multi-Press Stand BFPR10, and take advantage of its many features and benefits. Determining a regimen of regular workouts and exercise programs that accommodate your comfort, skill level and workout goals is the first step to a lifetime of health benefits, but, many people are intimidated by the thought of joining a health club, and others haven't yet discovered the particular exercises and routines that are right for them. That's why Best Fitness is committed to providing our customers with machines and equipment tailored to your everyday needs for easy-to-do workouts and easy-to-achieve results. Best of all, some of the most basic and efficient exercises can be accomplished in the comfort and convenience of your own home. Designed to be used straight out of the box, the Best Fitness Folding Bench is functional, compact, portable and durable to offer all the flexibility you need to get all the benefits of resistance training without the high cost of a home gym. When you are finished with your workout, simply fold it up, and store it away! 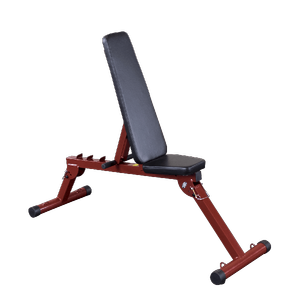 Order your Best Fitness BFPR10 Multi-Press Stand from FitnessZone.com Today!